From my daughter, filling in for her slacking old man. 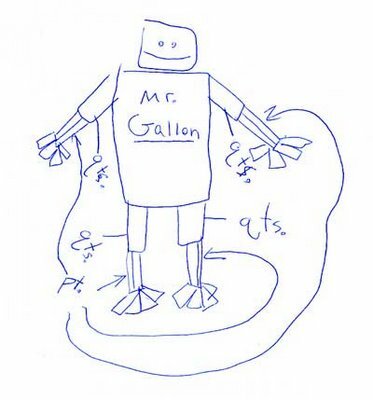 We were discussing how many cups in a gallon and she broke into a song about it and then described The Gallon Man and drew up a diagram. Apparently the G-man is a popular figure in elementary learning. No liquid measurement left behind. If you go to Laura Candler’s website she has a ton of teacher resources. Among them are a bunch of Gallon Man resources. Go to this page and scroll down to Time & Measurement for some “Mr. Gallon” information. This entry was posted in daughter, doodle, doodles. Bookmark the permalink.